SPY fell by 1.6% this week, while my account managed to eke out a 0.1% gain. The market has spent the last five weeks coiling itself up into an ever-narrowing trading range. It ended Friday at the bottom of its range (or below its range, depending on how you draw the trendlines). On Monday, the market should either bounce or crash. Euro news: The Constitutional Court of Germany said what was politically necessary for it to say to preserve the EU. But by Friday, the #2 man at the ECB quit his job, presumably because he thinks the sovereign default they are paying billions to postpone is unavoidable. Rumours immediately started swirling that Greece will default on its debts this weekend. If the prices on credit-default swaps are to be believed, the likelihood of a Greek default is about 90%. Economy: The OECD said Thursday that Q4 world economic output will rise only 1.0%. The OECD’s figure is probably overoptimistic. RWM: Bought more on Tuesday. Used a 3% trailing stop on those shares and the ones from last Friday, which stopped out just before the close on Tuesday and settled on Friday. Because I have a put, and have already sold half the total shares purchased, I cannot lose more than 2.3% on RWM. But if I exercise the put then I will lose the 1.0% I spent on it, for a total loss of 3.3%. Even if the market bounces next week, it seems the put will expire worthless next Friday. Schwab claims that the put is worth 25¢ per share because that was the last trade price, but there have been no bids for several days so there is no one who would buy it from me. Effectively, its value is already zero. RPRX: Not going anywhere. It’s getting close to the time when I said I would make a keep/dump decision for RPRX. It’s looking like the answer is going to be “dump”. If the market bounces, I could sell the put and ride the stock up the bounce (but this approach didn’t work when I tried it with FRED). 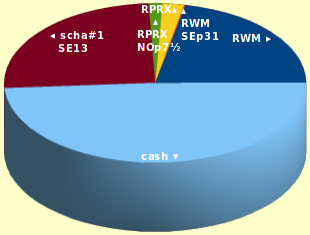 SCHA#0: Last week’s sales settled this Wednesday & Thursday. SCHA#1: First use of the new MACD-based trading system. Works! Bought 11:02am Wednesday; sold 3:00pm Thursday. This prevented my account balance from going any more negative than -0.5%, although I ended up not gaining much from the trade itself. IAU: It’s not trending, so I’m not buying. The SCHA#1 trade yielded a 0.3% gain. According to the IWM chart, buying that security at 11:00am and selling at 3:00pm should have yielded a 0.04% loss before trading costs, but SCHA doesn't track IWM quite that precisely. Since my median gain with these hourly trades is only about +0.4%, a 0.3% difference between theory and practice is a big deal! I have no idea how often the divergence will be in my favour like this. Buy (if not already bought) when PPO has risen by at least 1.1 over the last 11 hours, even if price is below SMA(n), even if price fell during the last hour. Do not sell due to PPO going below ϶ until after it has risen above ϵ. Sell (if not already sold) when PPO has fallen by at least 0.35 over the last 11 hours, even if price rose during the last hour. Do not buy back due to PPO exceeding ϵ until after it has fallen below ϶. Increase ϵ to 0.4 and ϶ to 0.07. Other rules same as last week’s hourly system. Now that there are two rules for ”buy” and two for ”sell”, I will buy when either rule triggers and sell when either rule triggers. This ruleset would have made a profit of 4.0% this week, rather than -0.04%. It still shows an overall profit of about 26% over the last year, but the win:loss ratio is now 21:11 rather than 28:20. There would have been 66 trades out of roughly 1250 hourly checks of the market, so 95% of the time when I checked the answer would have been ”do nothing”. I am not sure that I can maintain such a low activity level! I also tried doing calculations using TRIX. By the time I got it tuned, it was producing approximately the same answers as PPO—but its profits were better than PPO's only during the previous bull market and worse during our current bear, which is the opposite of what I want. So I’ll stick with PPO for now.